Isaac Mostovicz’s thoughts on luxury and connoisseurship more generally. Luxury is in the eye of the beholder. Thetas (Θ) and Lambdas (Λ) interpret the world in different ways -– the typical Theta personality seeks affiliation and control as an ultimate life purpose, whereas Lambdas seek challenge and uniqueness as an ultimate end goal. This section addresses the impact of these preferences on our luxury choices. A common misunderstanding about luxury is that it is part and parcel of certain products or services. This is the wrong approach! Luxury is, in reality, a specific approach to marketing a good or service so that it touches the deeper needs of a customer. For example, in my article “Why diamonds stink more than fertilzers?” the term used to describe the success of ICI– Fertilizers was “segmentation.” Nevertheless, a close examination revealed that fertilizers were marketed as a luxury. Yes, even that stinky substance could successfully become a luxury item by following the rules. How about your business? There are a handful of factors which characterize luxury. One prominent factor is price. A luxury item is expensive and is never sold at discount. ICI-Fertilizers managed to sell fertilizer as a luxury at higher prices while their competitors sold fertilizer as a commodity at prices that barely covered their costs. Many times almost an entire industry lowers their profit margins to a dangerous level while one company maintains high prices, Apple, under the guidance of Steve Jobs, is a good example. Many companies left the market because they couldn’t compete any longer, but Apple kept selling PC’s at high margins, becoming the largest and the most profitable company in the industry. This was possible because they followed the rules of luxury. Let’s examine the PC, they are bulky, ugly and tend to have a narrow range of colors and designs, and the software is not great. On the other hand, Apple asked themselves what were the customers’ needs. They realized that nobody needed a PC, and a PC was just a means to a goal. By understanding the deeper needs of the customers Apple designed its computers to deliver those inner needs creating its legendary interface. The end result was a machine whose role was to satisfy the user’s needs. Apple doesn’t charge for its PC’s, it charges for satisfying deep needs, something that no other company had managed to do. This approach brought in more money, higher margins, and loyal customers. On the other side of the coin we have diamonds. What should be considered the pinnacle of luxury has turned into commodity. Instead of understanding why the customer wants a diamond and satisfying that particular need, the entire industry is focused on offering a product that actually doesn’t have much use. Consequently, diamonds became commodities and people slashed prices to a point that brought the industry to a state of bankruptcy. To turn something into a luxury is not easy. On the one hand, if one follows a limited number of rules it is possible. Following those rules calls for commitment, changing our mindset, high moral values, and ultimate responsibility for what we are doing. In my workshops I stress the importance of personal values and caring for the customers. Do it right and commit to it and your offering will become a luxury, providing you with tremendous satisfaction. Do you have the courage to jump into the water and start swimming? In the next few articles I will explore other aspects of luxury. Stay tuned. This was super informative! So glad I just redad this. It has taken me some time to correctly position the “Kahro Diamonds” brand – a new venture of mine in the Raleigh, North Carolina area of the United States. It would have been easy to turn Kahro Diamonds into just another local diamond dealer, but it is so much more than that, and I wanted to capture this in how I talk about our work. Ever since Randy and I began in our careers in the diamond business, we have kept asking ourselves what exactly it is that our diamond customers are actually seeking. As with most purchases, it typically begins with the desire to satisfy some need or to overcome a feeling of unease in their current lives and to move forward in their lives. It has less to do with the product or service itself, but rather the symbolic “attributes” which align with the psychological state of the customer who wishes to improve his or her position, for instance, a person who isn’t satisfied with their current age and wish to buy something which helps them appear older or younger, or a person who believes that they will be happier with a higher level of income or a different occupation. In short, it is for people who feel unhappy or unsettled with where they are at in their lives and who wish to move elsewhere psychologically. In the marketing world, this is called the “tension differential”, and it leads to actions that would fulfill people’s need for a change. Once marketers identify this tension differential, they can offer products and services that can be used as a solution to try to overcome it. Most jewelers do not bother to check the psychological reasons behind the will of the customer to purchase a diamond. Instead, they are happy to have a customer who asks for one and then they simply do their best to satisfy his request. However, do they know what the true need behind this request is? Does the customer know how diamonds can answer to such a need? One of my academic publications addressed this issue and I commented on it several times in my blog. Unfortunately, nothing has changed. The situation within the diamond industry has been going from bad to worse for some years already, and it seems that the more reflective of these jewelers are not visible. It’s this observation that sits at the heart of the “Kahro Diamonds” brand. The life mission of Kahro Diamonds is to help our customers to clarify their “tension differential”, whether it’s someone who is looking to propose to his girlfriend, or a married couple wishing to bring back the passion into their relationship. We aim to explore with our clients together what it is that is keeping them from their goals. This work has to be done very carefully, and in many ways, the work of Kahro Diamonds is not much different than that of a marriage consultant or therapist. However, Kahro Diamonds asks an additional question: “How have you got to where you are now?” For example, nobody expects or plans his marriage to falter after some years. This is an unwanted result – perhaps due to the stresses of everyday life or the routine of work. And even if we can help get the couple back on track, how can we ensure that they won’t find themselves back in this unwanted situation in a few years’ time? Here comes Kahro Diamonds with its one-of-a-kind knowledge of diamonds. In the same way that every relationship is unique, so is every diamond. By helping couples to carefully choose the right diamond for them, the couple sets off on a process that helps them understand and capture that same uniqueness and beauty in their relationship. This connection not only brings back the sparkle into their relationship but it will turn it into an eternal flame. After all, diamonds are forever. Kahro Diamonds currently works locally in Raleigh, North Carolina. But we hope that this initiative can eventually serve to inspire the entire diamond industry to transform itself and reinvest in a diamond’s true value – namely, its ability to lead people to new discoveries. Can Materialism Help Coping with Stress? Recently, a research by Frof. Eli Somer of the University of Haifa and Dr. Ayalla Ruvio of Temple University in Philadelphia PA. argued that the more materialistic people are, the more they will go on a shopping spree when exposed to trauma. I was intrigued by the claiming that materialism can predict how people cope with stress, asking what materialism is and how it is defined just to find out that we all are materialistic. We all acquire and own material goods, or goods that have some monetary worth to achieve life goals and desire states. Put it simply we all spend money unnecessarily not only for satisfying our basic needs but for achieving higher goals. Sounds familiar? Isn’t this an example of luxury behaviour when we overspend needlessly? Somer and Ruvio conducted their research in Sderot, a southern Israeli town which was exposed to non-stop rocket and missile fire from Gaza terrorists for over eight years. I had an opportunity to host children from Sderot and witness how much those children suffered from this long-term exposure to stress. To alleviate this taxing stress people went on shopping spree time and again. While the less materialistic people coped with the continuous exposure to danger by seeking social support the more materialistic ones were more oriented toward objects than humans. Do you agree with these results? In my opinion, the researchers stopped too early and didn’t ask the “how” and “why” questions. Materialism is part of our life and people need it and use it to satisfy their needs, especially that of enhancing their self-esteem. With continuous exposure to danger it is a never-ending fight and people need to remind themselves of the importance of their self. Some seek professional support and some turn to purchasing objects. However, the purchasing activity, per-se won’t help in extreme situation such as non-stop terroristic aggression over many years. What might subconsciously help in mild situation won’t help in these extreme cases without understanding consciously why we overspend needlessly and how this overspending can help us coping with stress. I don’t think that materialistic behaviour is counterproductive as the researchers argue. I do agree that the behaviour by itself might even increase the post-traumatic stress symptoms if people do not deeply understand the “why” and “how” of luxury. And from materialistic point of view it is possible that it would be cheaper to let people go on conscious and deeply understood buying spree than sending them to therapy. What do you think? Do you really want to see a change? This is the second part of my previous blog and proposes a strategic marketing approach for the diamond industry. As in 2008, I was approached with an important question. It is easy to criticize, but are there suggestions you can share with the diamond industry about what steps it should take to pull itself out of its misery? This is an honest question and while I cannot outline a full plan here, I will draw people’s attention to some basic ideas that I think they should follow if they are really concerned with the diamond industry’s future. Actually, these ideas are basic to any marketing strategy in any industry with any offer. Sounds simple? You’d be surprised to learn how many companies do not know their customers. Decisions are made high in the supply chain while the customer is at the end. How many executives really bother to go out and meet their customers, to talk to them and learn what’s on their minds? How many know how to ask the right questions? The old marketing adage says that we buy by our emotions, but justify the purchase with logical arguments. How many know what the emotional motives behind a purchase are? How many know how to identify those motives? How can we make a marketing decision when we do not know what motivates the customer and how we can satisfy the customer with our offer? Know your customer, figure out his emotional needs and see how you can answer them with your offer. This is the other side of the marketing coin. In 1938 De Beers understood that it had to create demand for its diamonds and invented the market for diamond engagement rings. The diamonds used were relatively large and were suitable for solitaire rings. However, with the discovery of the small Russian diamonds which did not fit the engagement offer, De Beers developed the idea of the anniversary ring which used those tiny diamonds. The anniversary ring was a derivative of the original offer of the diamond engagement ring and those tiny diamonds were found to satisfy the needs typical for a couple a few years into marriage. However, when Indians proved that they could polish diamonds that were previously considered unpolishable, nobody came up with a suitable marketing offer. The diamond customer today has a variety of emotional needs that need to be mapped. Next, the diamond stock needs to be mapped as well. Different diamonds are suitable for different emotional needs. We know about two types: the relatively larger diamonds, mainly solitaires for diamond engagement rings, and the smaller ones suitable for anniversary rings. However, we need to map the diamond stock more carefully and in detail so as to get a clear picture of what diamond is suitable for satisfying which particular emotional need. Are we sure that any polished diamond is actually a diamond that can be offered as one, once we take into account the emotional needs of the customer? Can any polished crystalized carbon be used in jewellery? I should point out that in general, marketing offers like I’m describing are not common in the diamond industry. A marketing offer reflects the answer in the market found to the emotional needs of the customer. Answering these needs creates a “pull” effect, or true demand. By comparison, when the diamond market became totally unaware of the emotional needs of its customers and was concerned merely with disposing its wares, it created a “push” effect. The reason behind this practice is financial – pleasing the bankers and competing on supply. The sad result is that nobody pays attention to whether the customer really wants the product in the first place. Do we have a loyal diamond customer? Most customers are excursionists who go to the jeweller for their engagement rings and disappear from the horizon for the rest of their lives. Even when we bring them to purchase again, it takes a few years. Most jewellers act as supermarkets as opposed to carving out a niche for themselves. They sell an engagement ring today, tomorrow another piece of cheap fancy jewellery and will even replace a watch battery. However, in acting as supermarkets, they become supermarkets – providing no personal attention, no brand identity or affinity, with shelves packed with indistinguishable offers and cashiers at the end waiting only for the customer’s money. Has anyone asked himself what he really wants to do? What market he wants to concentrate on? Many years ago I was sitting at a panel with the London jeweller Theo Fennell. Theo argued that he does not want to cater to the engagement ring market since the emotional, social and financial burden that lies on the man’s shoulder is so enormous. A representative of De Beers stood up and claimed that this approach is insane since statistics show that the market for engagement rings is the most important by far. To this Theo very gallantly offered that this woman shove her statistics up somewhere, since he was dealing with real people and not with numbers. Theo had a clear idea of who he is and who he would like to meet. Occasionally he would sell a diamond engagement ring but this was clearly not his market. He does not replace watch batteries either. To sum up, if we are really concerned with the future of the diamond market, we have to take three strategic steps, by answering these very fundamental questions. Firstly, we need to ask whether there is a market out there for our product or if we can we create one. Are there any emotional needs that are worth pursuing and providing an answer to? De Beers realized in 1932 that there was no diamond market and went about creating one. Secondly, can we satisfy these emotional needs with our products and how? Is it a single need that we need to satisfy, an entire range of needs or maybe a single need that keeps on changing its face according to socio-demographic concerns? Which of our products are appropriate for which emotional needs? What products do we still need to search for the need that it will be the answer to? Finally, are we looking to satisfy the entire range of desires or are we interested in carving our own niche? What would this niche look alike? What do we have to know? What supply channels do we need to secure? Most importantly, how can we communicate our existence to our customer of choice? If the diamond industry or any other industry would follow these guidelines, I think they would succeed. One of the people who inspired me most was Steve Jobs who had a clear vision and could answer these three elements of proper marketing fully. Unfortunately, it seems that Steve Jobs took his vision with him and did not leave his legacy in Apple. This does not mean that we cannot turn the diamond industry or any other industry around. After all, what I describe here is what I call luxury marketing. I was at the JCK show in Las Vegas last week. The JCK show is one of the largest diamond and jewelry shows in the world and almost everyone in the diamond industry attended either as a presenter or as a visitor. One of the highlights of the show is Martin Rapaport’s review of the diamond industry. Rapaport’s speech recalled for me the immortal Pete Seger song, “Where Have All the Flowers Gone?” because it seems that the industry has not changed its practice despite reality continuing to slap it in the face. I would like to introduce you to one of my clients, Groopex (http://groopex.com). Groopex is a start-up high-tech company which provides integration solutions between third party software and Web Conferencing platforms such as Cisco WebEx and Citix GoToMeeting. Did you understand that definition? Well, I did not, since Groopex’s language is technical, suiting only the technical people in the organisations. So, when I was approached by Groopex, the first thing I needed was a better layman-style definition of the product. You are most probably familiar with distance learning. Most of my studies were conducted in this manner, utilizing emails, websites and some older technology such as snail-mail, video and audio cassettes (which were considered really innovative at the time). Nowadays you can find many recorded classes online, yet there is still no alternative to a live interactive class where you can ask questions and provide comments, and where the teacher can moderate the class according to its ad-hoc needs. Here came Groopex, enabling one, with a mere click, to participate in a live class from any location to enjoy a class experience practically identical to a regular live class. While the technology had been created and was running well, Groopex was still struggling with its marketing. I inquired who the company thought the classical client would be, and got a wide range of answers. Even with the working assumption that the product should suit universities, interested in reaching students even remotely, Groopex could not pinpoint whom to approach in the universities. Should they approach the technical staff that would understand and appreciate the technology, or should they approach faculty members who can see the potential in teaching? Perhaps the best ones to approach would be the management who could see the financial opportunity and the benefit to the institution’s prestige in this solution? Reviewing the history of Groopex, I discovered that the company’s idea was based on one of the founders’ successful website, WebYeshiva (www.webyeshiva.org) which offers on-line classes in an elaborate way. Surprisingly, I found that the ideal class size in WebYeshiva should be no larger than 25 students, a size which allows the class to be fully interactive. WebYeshiva didn’t offer an asynchronous video of a class; rather it offered an interactive class where the teaching experience is a multi-layer one. WebYeshiva didn’t offer a second-class solution to those faraway who could not attend a regular class; rather it offered a first-class solution for studying regardless of distance. High education nowadays has a serious problem. Students keep on pushing for easy solutions. Prof. Jeffrey Pfeffer of Stanford University Business School related to me over five years ago that MBA students stopped reading; a must when I studied and was required to read a lot. He sounded desperate looking for solutions such as creating videos, realising that the more passive the students, the less they absorb. I helped Groopex realize that they actually have created an in-situ solution that could be an answer to the laziness and passiveness of modern education. Instead of the failing old system of lecture, reading and some questions in class, Groopex can offer a much richer experience. Each class can be consisted of a lecture, exercises, highlighting of relevant text, using rich technology tools for exhibiting material as well as enhanced Q&A. For example, a typical MBA class at a good university can have up to seventy students. Good lecturers could interact with each student three times during a semester at the best. Further, consider those students who fret about interactivity due to shyness or fear from answering incorrectly and losing face. Using Groopex’s technology, the lecturer can broadcast the question to several students in advance to their computer screen and get several answers, some of which might be similar and some different. The students can keep their anonymity and have time to prepare their answer. Why should a student have only three chances during a semester instead three chances during each class? This is but the tip of the iceberg, and those interested can approach Groopex directly and experience the approach that Groopex enables. However, you may ask what the connection between all this and luxury? The answer, I believe, is simple. Luxury’s role is the enhancement of self-esteem. While Groopex would never be able to turn a bad teacher into a good one, it would definitely provide the good teacher with a modern tool-kit that will permit him to express himself in a much richer way to his students. Moreover, the students come out of this new educational experience with a feeling of enhancement and fulfilment. With Groopex we can bring back the playing experience that is so essential to learning. Students are no longer suffering but feel stronger and trust themselves much more. Internet technologies in general and mobile devices in particular allow us certain independence. For example, today, many people book their flights online, check in online and get an electronic ticket, and use their mobile device to show that ticket at the gate. Unfortunately, these technologies can potentially be exploited by our service providers. A recent study illustrates how financial service companies are promoting the idea of the self-service customer. These financial institutes provide increasingly sophisticated self-service information, used especially on mobile devices, to help people find various financial offers, compare between various products and services, and manage their accounts. The author raises two interesting points. Firstly, he argues that self-management may lead to more and more customers making wrong decisions without the help of an expert. While the author proposes some suggestions for overcoming the lack of expert service, much has yet to be accomplished to put such a service on par with the current offline practice. These financial institutes are self-concerned. They see their margins eroding and their balance sheets heading south and they look for ways to offer an efficient service while cutting overhead and excessive staff. What is wrong with their approach is not that they are striving for greater efficiency, but that their main motivation is self-concern. While they claim that they want to offer a win-win solution, all that is sure is that they are winning. Whether the customer wins is unspoken for. What is wrong here is not what these institutes are doing, but what is behind it – concern for their own issues. An example on the other side of things –Starbucks started enabling customers to use their mobile devices to order their preferred beverage online, pay for it by waving a barcode on their mobile device in front of a scanner, and send invitations to friends to meet at a certain coffee shop, complete with a map and the option to order their favourite beverage en route to the store. The report that appeared on Bloomberg is full of financial data. It shows that Starbucks invested $25 million in the venture, that Starbucks hopes to pay fewer fees on credit card transactions, and that Starbucks hopes the system will make the company more efficient and increase its sales. Again, the interesting nugget is not what Starbucks is doing but why it is doing it. Years ago, Starbucks discovered that people are ready to overpay for their coffee and since then sells coffee at a premium price, as luxury. However, the luxury is the cup of coffee, not the experience of purchasing it, which can actually become a drawback. Being the provider of a mass-market luxury therefore, Starbucks suffers from its success. During peak hours people waste a big part of their lunch break standing in line and waiting to be served. Starbucks’ offer started to become a burden. Starbucks found a way to peel off that burden while keeping its luxurious offer intact. With its new program Starbucks manages to offer its luxurious coffee again without taxing its customers. Was it a sound business decision? Of course, more people will buy this expensive offer more frequently, Starbucks will operate more efficiently, and ultimately increase its bottom line. However, the customer only appreciates this program because in his eyes, it is for him and not to enrich Starbucks. Ask the happy customer and he’ll tell you that Starbucks is concerned with the customer’s needs. Over time any offer should be updated to incorporate new technologies and new social behaviours. Nevertheless, we should not lose our focus. If we focus on our own needs, we will eventually be punished by the customer. However, if we use the same technology, but focus on the customer’s needs, we will be rewarded handsomely. The luxury world’s relationship with the counterfeit industry is puzzling. The counterfeit industry seems to cannibalize the luxury industry by offering products that presumably people would have bought from the luxury industry in the first place. However, as I commented in the past (I need to find the article) the luxury industry does not fight the counterfeit one wholeheartedly. 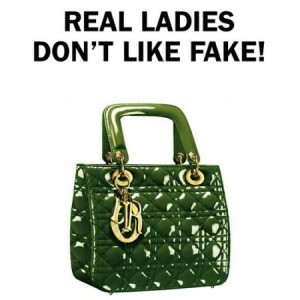 The luxury industry has very good reasons to allow the counterfeit industry to exist. Having counterfeits means that the original has increased status, as Prada’s CEO announced recently, “We don’t want to be a brand that nobody wants to copy.” The counterfeit industry allows the wider society to become fans of the brand while those who use the true product feel more elite and more respected. More significantly, a Sloan MIT business professor Renee Richardson Gosline found that people use counterfeit as an entry-point to luxury. Gosline discovered that within two years, 46% of buyers of counterfeit subsequently purchased the authentic version of the same product they had purchased the counterfeit of — even though other people could not necessarily tell the difference. However, there are problems with buying counterfeits. James Lawson, director of Ledbury Research, points out that most of the time their quality is inferior and it is socially uncomfortable to admit to using a fake. Therefore Lawson suggested that renting luxury products could become a superior substitute for counterfeits, and provide an entry-point to the brand as well. Renting genuine luxury products seems to offset the problems of low-quality and social discomfort associated with fakes. One can experience the thrill of having true luxury products at a lower cost, and then return them later. It is true that renting luxury may eliminate some of the problems with buying counterfeits. However, from the luxury marketer’s perspective, a major difference exists between them: the time span. People who buy counterfeits become accustomed to having the product in their lives. They identify with the brand that the counterfeit is imitating, and often seek to buy the real thing eventually. Renting luxury doesn’t give this experience at all. People have the great feeling of using luxury, but for a short time only. They don’t necessarily identify with the brand, and there is so far no evidence that they move on to buy the real product. While renting luxury may replace buying counterfeits in the short-term, it is clearly inferior from the perspective of being an entry-point to the brand. I feel ambivalent about this increasingly popular phenomenon. I would argue that a major component of the luxury experience is purchasing a luxury item at a high price. Renting luxury does not provide a luxury experience just because it involves luxury products. Unlike counterfeits, it is also not an entry point to luxury. However, while it may not fit the definition of luxury, nor lead to a luxury experience, who does not want to be king, even if only for one day?